Q. 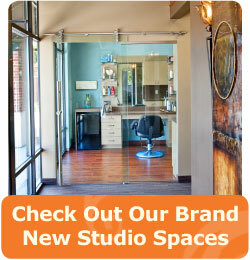 If I become a studio owner, will I be working for Aria Salon Studios? A. No. Each Aria salon owner practices beauty as an independent consultant and can expect to be treated as a business owner, not an employee. You will have the freedom to manage your own schedule, prices, clientele and space as you see fit. You get all the benefits of owning your own salon without the risks. Q. What kind of tools are available to me to help me get started? A. Our state-of-the-art facilities and high-quality equipment are at your disposal as a salon owner. You will also have access to convenient online tools that will make recruiting clients and managing your schedule stress free. Your clients will love how easy it is to schedule time with you, and you’ll never have to play phone tag again. Because we’re dedicated to your success, we provide timely support and advice for all your business and styling needs. Q. Can I be a studio owner and balance my family life? A. As an Aria studio owner, only you are in charge of your schedule. Work as many or as few hours as you want, whenever you want! Q. How can I add my personality to my Aria studio? A. Your studio is your own personal space to practice your craft and make your clients as comfortable as possible. For this reason, it is yours to decorate as you see fit and let your personality shine. We feel this makes a real difference for each beauty professional – one your clients will notice, too. Q. How do I know if I’m ready to own my own studio at Aria? The most important thing to evaluate is your client list. Do you have a loyal base of clients who provide you with a consistent stream of income? As a community of independent salon owners, Aria thrives when each independent stylist is successful – that’s why we seek experienced stylists with loyal clients. Still not sure if you’re ready? Call 330-423-1136 or email tonyc@ariasalonstudios.com and talk it through with an Aria representative. Q. Does Aria see my client list? A. No. Your private client list is yours, and yours alone. The only time we may ask about your clients is while helping you determine if Aria Salon Studios is the right move for you based on the approximate number of recurring clients you have. Q. Will there be walk-in customers at Aria Salon Studios? A. Yes, there will be walk-in customers who will want to tour Aria Salon Studios and inquire about the various services offered. Being courteous and helpful to these walk-in customers can help build your already established clientele.